Enjoy hundreds of advanced visual effects filters, thousands of presets, and advanced motion tracking with the Sapphire 2019 + Continuum 2019 + Mocha Pro 2019 Bundle for Adobe from Boris FX. All three applications are compatible with Adobe After Effects and Premiere Pro, while Sapphire 2019 also works with select OFX applications such as DaVinci Resolve, Fusion, Nuke, Vegas Pro, Baselight, ToonBoom Harmony, Rio, EDIUS Pro, and Silhouette. This bundle includes an upgrade from Sapphire 11 to Sapphire 2019, from Continuum 11 to Continuum 2019, and from Mocha Pro 5 to Mocha Pro 2019 for Adobe. 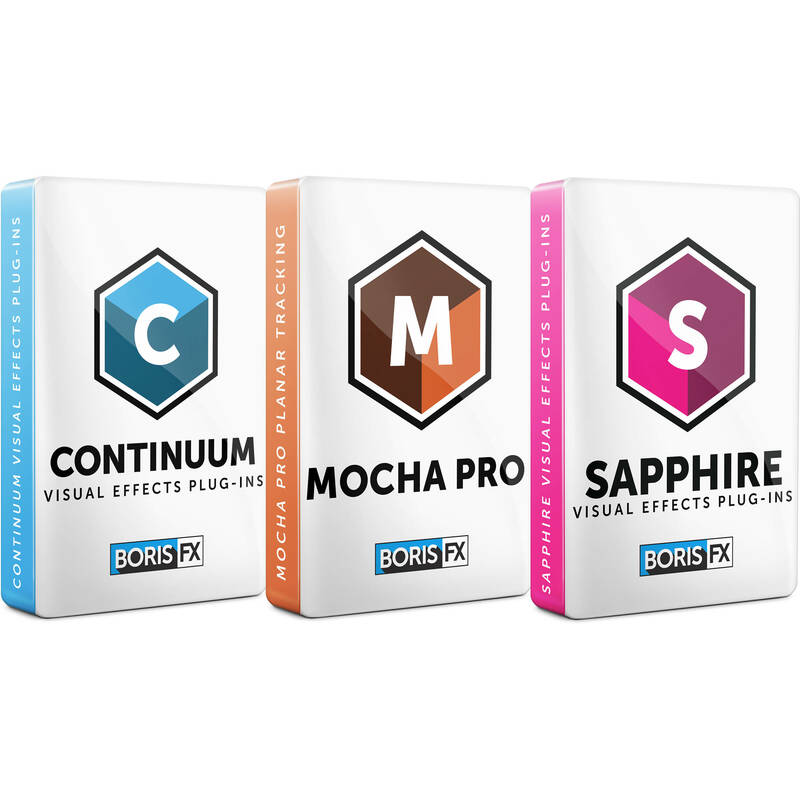 Boris FX Continuum 2019 for Adobe After Effects and Premiere Pro is a comprehensive visual effects and compositing plug-in collection. It consists of all individual Continuum 2019 Units, hundreds of features, and thousands of presets which are customizable. If you customize a preset, you can save the personalized version as a new preset that can be recalled later. Many of the filters also feature a built-in PixelChooser with integrated Mocha planar tracking that allows for greater control over which areas of the image the filter should affect. This version includes an upgrade license from Continuum 11 and renews one year of upgrades and support. Between all the different filters, you can create 3D titles, logos, and shapes; apply various art styles; create various blurs and manipulate focus; make grading and toning adjustments; add film looks; restore images; apply compositing and cleanup; simulate most types of light; manipulate motion data; design realistic particle effects; display images in different perspectives, such as shattered and dispersed into space; add stylized visual effects, like damaged TV looks; add textures; manipulate time with loop and other effects; add transitions; apply common VFX solutions for VR/360 video; and distort and morph video in various ways. Continuum 2019 for After Effects and Premiere Pro can be used in your host application on Mac or Windows, as supported by the host. Note: This download includes an upgrade license from Continuum 11 and renews one year of upgrades and support. The 32-bit float color processing option in Continuum, which has always been available in hosts such as After Effects, has been extended to include the Premiere Pro host with deep color support enabling users to generate HDR content without clipping. Charcoal Sketch takes input from an image clip and converts this into a charcoal sketch-style animation. In addition to advanced controls to fine-tune the result of contouring and line generation, the filter allows for detailed control over line softness, line style, and line threshold. Pencil Sketch takes input from an image clip and converts this into a hand-drawn pencil sketch-style animation. In addition to advanced controls to fine tune the result of contouring and line generation, the filter allows for detailed control over line softness, line style, and line threshold. Gaussian Blur implements a popular blur algorithm that produces very smooth blurs. Gaussian Blur softens the image by averaging each pixel with its neighboring pixels. The word "Gaussian" refers to the bell-shaped curve commonly used in statistical analysis. The shape of this curve determines how much each averaged pixel contributes to the output. Lens Shape emulates a lens blur defocus/rack-focus effect where out-of-focus highlights of an image clip take on the shape of the lens diaphragm; however, Lens Shape takes an image input and uses this for the highlight shape. When a lens is used with its aperture fully open, the out-of-focus highlights are typically in the shape of a circle; however, when the lens is stopped down the highlights turn into multi-sided shapes. This filter includes a pop-up that can be used to match the different looks that can be achieved in the physical world based on the lens aperture setting. Fast Lens Blur also includes a comprehensive depth-of-field (Z-Depth) option whereby a separate image can be used to control the depth and position of the focus field. Pyramid Blur emulates the look of shooting in soft focus or with lens diffusion. It allows you to blur the horizontal and vertical components of the image separately. Pyramid Blur uses a refined algorithm that speeds rendering approximately 20-40%. 3-Way Color Grade enables you to color-correct an input image using industry standard Lift-Gamma-Gain controls with an intuitive color sphere and slider interface. The filter includes a built-in keying option for isolating secondary colors from the primaries and power window style masking (with 2-point motion tracking), which allow you to isolate or selectively apply the color correction to a specific region of the image. Independent color correction adjustments can be applied to points inside and outside of the key-mask selection within a single instance of the filter. Compare controls, located at the top of the filter, let you compare the input and processed image, or two independent color correction settings applied to the image. All internal processing in this filter is done in 32-bit floating point for maximum precision, thereby eliminating any round-off errors. This allows you to combine extreme settings of the different controls without introducing banding on the image output. Levels Gamma provides options for adjusting contrast and eliminating noise in your image. Video shot at night or in poorly lit settings often contains noise in the dark areas. Increasing Input Black removes this noise by treating all areas darker than the Input Black setting as black. Washed out or overexposed images do not contain the full range of levels. Increasing Input Black and/or decreasing Input White can boost the contrast of the image. Lens Correction is designed to reduce or remove image distortion in source clips that were shot using a wide-angle or fisheye lens. It can also be used to make simple perspective corrections. Lens Correction includes a number of presets specifically designed for GoPro action cameras. Boris FX Sapphire 2019 for Adobe/OFX features 200+ advanced and highly stylized effects, transitions, and looks and over 3000 presets for all aspects of your films and videos. Combining everything from the individual Sapphire 2019 Units, Sapphire 2019 provides large collections of Adjust, Blur and Sharpen, Distort, Lighting, Render, Stylize, and Transitions filters. Many of these are considered must-haves in the film, TV, and commercial production industries, with the Lighting effects perhaps the most widely relied on. Sapphire 2019 for Adobe/OFX renews one year of Upgrades & Support for new releases of the software as well as phone/email technical support. The entire package is resolution-independent and can be used on footage in any format, including 8K and above. All effects also use full floating-point processing for improved image quality and full 32-bit HDR support. Sapphire 2019 also integrates the Academy Award-winning Mocha planar tracking and masking engine right into the interface. You can now launch Mocha right from within most of the included effects and create and track a mask. Mocha offers multiple ways of applying masks, including simple isolation and full rotoscoping. Sapphire 2019 for Adobe/OFX includes the sophisticated Sapphire Builder, which allows you to create and save your own complex custom effects using a simple workflow. The Builder is a node-based effect compositor where you can create from scratch, stack and connect other effects/transitions, and control every aspect of an effect using extensive parameter sets and numerous on-screen widgets. The Builder is filtered by common tasks, such as "color-correction" and "lighting," rather than by effect name, for much easier browsing. There are multiple new features and enhancements in Sapphire 2019 such as LensFlare, FlareDesigner, Pixelsort, WhipLash transition, and Mocha enhancements such as four new spline tools, a new look and feel, and retina and high-DPI monitor support. Also improved are the Effect and Transition Builder and enhanced GPU speed. Sapphire 2019 features updates to the Mocha planar tracking and masking tool such as four new spline tools, a new look and feel with the Mocha Essentials workspace, and adds retina and high-DPI monitor support. Mocha is integrated right into the interface, and you can launch Mocha right from within most of the included effects and create and track a mask. Mocha offers multiple ways of applying masks, including simple isolation and full rotoscoping. GPU acceleration has been improved to increase overall speed and performance and has been optimized for CUDA-enabled NVIDIA cards. Sapphire 2019 has also updated the LensFlare effect, the Flare Designer, and the Effect and Transition Builder. PixelSort is a new Sapphire effect that grew up in the modern digital "glitch art" movement. It's a fun new way to distort your image in a multitude of different ways and features many deep parameters to produce some stunning results. PixelSort is also available inside Sapphire Effect and Transition builder. Combine it with other Sapphire effects for a truly original effect, and use it as a transition to up production value in any edit. Sapphire WhipLash is a "sister effect" to one of the most popular Sapphire transitions, SwishPan. It has some amazing new functionality and features that will undoubtedly make it the Sapphire transition of choice. At its core, WhipLash is a new transition that mimics a lighting quick camera pan, blending multiple copies of an image together so it appears as if a great distance is traveled in a short amount of time. WhipLash also features a soft bounce stop, a smooth finish, or a snapback at the end of the transition. RGB separation blurs can be added for a different look and WhipLash can travel in any direction or angle as well as scaling up or down. Generates a monochrome version of the source clip using adjustable weights for the red, green, and blue channels. This can simulate the use of a color filter applied to the lens of a black and white camera. For example, use more red weight to darken blue sky areas of the input. The weights are scaled so they sum to 1 before being used to reduce overall brightness changes when they are adjusted. Reduces the chrominance of the input clip if necessary so it is not above a specified maximum. This effect can be used to make broadcast-safe colors. It can also be used to scale the chrominance, clamp the luminance, or scale the luminance. Sets the color channels of the source clip to Full On or Full Off using a given softness and threshold. This can be used to increase the contrast of each color channel independently. Identifies all pixels that fall outside a given color range, and flags them with the same color so they can be seen easily. Performs an interpolation between four specified colors using the brightness of the source clip. Performs an interpolation between three specified colors using the brightness of the source clip. Inverts the colors of the source clip, so black becomes white, and white becomes black. This can optionally also invert luma, chroma, RGB and alpha channels independently and do some basic color correction on the inverted result. Adjusts the hue, saturation, brightness, and/or offset of the input clip. Generates a hotspot image containing areas of the source clip brighter than a given threshold. The colors of the hotspots should match the original source. This can be used for increasing contrast or finding the bright areas of a clip, but without changing the color saturation or hue of the result. Applies a gamma correction to the input clip. The red, green, and blue channels can be adjusted independently. From Gamma just causes the inverse effect of adjusting Gamma. Performs an interpolation between two specified colors using the brightness of the source clip. Reorders the RGBA channels of the source clip. Allows mapping any source channel into any output channel, with scaling and offset for each output channel. Simulate a real, defocused camera lens and preserve delicate highlights. Apply smoothing, de-aging, color correction, soft focus, and glow to skin regions. Produce a high-quality blur effect without sacrificing speed or interactivity. Add realistic motion blur to any clip with full control over angle, size, direction, and complexity. Blur the fine textures of an image while preserving crisp, defined edges. Smooth out a clip by removing banding artifacts and diffusing pixels across the banded areas. Smooths the source clip while retaining the edges. Combines a blurred version of the source with the original to give a soft focus effect. Applies a median filter to the source image, useful for cleaning up isolated spots and noise. Defocuses the color channels of the source clip into rings of different widths. Performs a motion blur and optionally transforms the source clip using the animated curves of the Z Dist, Rotate, and Shift parameters. If these parameters are constant, no motion blur will occur. Blurs the source clip in a given direction using a gaussian, triangle, or box filter. It can also blur each channel by different amounts. Separates the source into luminance and chrominance components, blurs the chrominance and/or the luminance independently, and recombines them. You can also scale the luma and chroma independently to enhance or remove either. Blurs each channel of the source clip by an arbitrary amount using a gaussian, triangle, or box filter. Warp the source clip to generate optical glass-like effects. Shake your video on the x, y, and z axis in three different styles: twitchy, jumpy, and standard. Separate your footage into multi-colored bands and warp them by different amounts. Twists the source clip into a vortex around a given center location. Warps the source clip by a wave pattern. Warps the source clip using two sets of overlapping wave patterns. Expands the center of the source clip as if viewed through a fisheye lens. Warps the source clip into a rounded disk shape. Blurs the source input clip in the direction of the gradient of the lens input clip. Transforms the source input multiple times and averages the results. Warps the source clip based on its gradient. Warps the source clip by a smooth noise function. This can be used to create heat diffusion or under water types of effects. Generate photorealistic and stylized lens flares or build your own custom flare. LensFlare and the Flare Designer are redesigned and reimagined. The Flare Designer is improved and enhanced to increase the ease of use and expand its functionality. The preset browser is now integrated directly inside the Flare Designer, making accessing and modifying lens flare presets a breeze. A new lens flare "component" workflow allows artists to easily and intuitively build a complex flare from scratch and helps reveal the power and flexibility of Sapphire's flare engine. Finally, 27 new professionally designed presets have been added. Generate natural, organic light from the brighter areas of your video. Areas of the source clip darker than the given threshold are blurred and combined with the input clip to give a deep smoky look. Glows areas of the source clip with varying widths depending on the depth values from a ZBuffer input. Generate high-quality beams of light that emit from the edges of objects within your video footage. Render sheer, abstract patterns of color that simulate light leaking through gaps in a camera body. Simulates lots of flashbulbs going off, like a stadium scene with many small flashes or celebrity red carpet with a few large flashes. Composite halos and glint rays into your video by detecting the brightest areas of the frame. Generate star-shaped glimmers in brighter areas of your video. Emboss or concave your video by using a custom relief map. Create large, bold, bumpy distortions or thin, glassy indentations. Highlight a specific area of your footage with a range of harsh and soft spotlights. Generates random, defocused lights that move around the screen. Generates glows of colored rings around the areas of the source clip that are brighter than the given threshold. Generates rainbow-colored glows based on the distances from the edges of the source input. Creates glowing light from the edges of the source clip. This differs from the default Glow in that small or thin objects generate as much glow around their edges as large objects. Also, the glow colors are not affected by the colors of the source clip. Creates motion blurs in the bright areas of the source causing streaks between the From and To transformations. This can be used to create an extended film exposure effect or simulate soft beams of light. Darkens the source clip at areas that are brighter than the given threshold to give an 'orthicon' or 'dark glow' look. Generates glows based on the distances from the edges of the source input. Any edges in the input image where the brightness crosses the given threshold value will generate an equally bright glow into the darker side of the edges. Generates star-shaped, rainbow-colored glints at locations where the source clip is brighter than the threshold. Generates glowing light from areas of the source clip that are brighter than the given threshold. The glows are also attenuated by a solid noise texture to give them a noisy or grainy effect. Generates a two-colored swirl of light along a user-controlled spline reminiscent of the Northern Lights. Add natural textural elements to dirty up a shot. Create photorealistic lighting with this versatile tool. Create photorealistic renderings of the moon that feature accurate lunar cycles. Create accurate star-fields by inputting date, time, and location. Simulates the flash and smoke that is generated when a gun is fired. Create abstract textures of fluctuating liquid or cellular patterns. Create an abstract texture resembling folded cloth or liquid that can be animated. Create animated backgrounds and textures from geometric patterns. Generate a quick and easy multiple color gradient. Creates a field of spots that can be distorted and animated. The warp speed parameter causes the spots to be distorted over time by a random warping pattern. Creates an abstract moire texture by adding together two patterns of concentric rings. Creates an abstract texture resembling moving nerve cell tendrils. Creates an abstract texture by applying a EmbossShiny effect to a procedurally generated noise texture. Creates an abstract texture by applying an AutoPaint effect to a procedurally generated noise texture. Creates an abstract texture resembling an electrical plasma effect. Creates an abstract texture resembling perpendicular woven strands. Generates a grid of lines and combines it with a background clip. Generates a procedural texture that looks a bit like a surface of a rough object under an electron microscope. Creates an abstract texture by applying a WarpChroma effect to a procedurally generated noise texture. Draws a shape into the image. It provides a wide variety of shapes, including polygons, circles, stars, flower shapes, and swirled starfish shapes. Make your video footage look like it was shot on film with realistic film exposure and processing looks. Simulates damaged film with many options, including dust, hairs, stains, scratches, defocusing, flicker, and shake. Add a glitchy, digital transmission error look to your videos. Simulates a TV with transmission and reception problems, VCR issues, and TV hardware difficulties, static, interference, ghosting, horizontal and vertical hold, hum bars, color stripes, visible scanlines, VCR fast-forward, dropouts, vignetting, orthicon, fisheye, and turn-off. Add a scan line pattern to your video to create a retro TV look. Simulate a film processing technique in which silver is not removed from the negative. Transform your video footage into a stylish hand-painted work of art. Simulate the warm vintage two-strip film process from the 1920s. Simulate the color three-strip film process from 1935 through 1955. Add colored or black and white grain to give your video a shot-on-film look. Create looks like chalk outlines, cartoons, or even neon lights. Adjust the border areas of your video to create a vignette effect. Breaks the image into circle shaped tiles and transforms the image within each shape to create a fly's eye view effect. Generates a 'paint-brushed' version of the source clip. Use the Frequency and Stroke Length parameters to adjust the density and shape of the brush strokes. Reflects the source clip into a kaleidoscopic pattern of triangles, squares, diamonds, or octagonal shapes. Simulates a traditional 2- or 3-mirror kaleidoscope. Modulates the brightness of the source clip with sinusoids for each color channel to give a color striped effect. Modulates the brightness of the source clip with a sinusoid to give a black and white solarized look. Breaks the image into rectangular tiles and shifts the image within each tile to create an effect like a wall of small randomly oriented mirrors reflecting the source image. Monochrome version of ScanLines. Creates a version of the source clip with a scan lines pattern resembling a black and white TV monitor. Combines the source clip with a stripe pattern and then passes them through a colorization process. Combines the source clip with a field of 'blob' shapes and then passes them through a colorization process. Generates a pixelated version of the source clip. Creates a version of the source input that is subjected to JPEG compression artifacts and errors. Generates a duotone version of the source clip using a repeating pattern of concentric rings. Generates a version of the source clip using a colored dot pattern. Generates a halftone version of the source clip using a black and white pattern of dots. Adds color and/or monochrome random noise of given amplitudes to every pixel of the source clip. Breaks the image into rectangle shaped tiles and transforms the image within each shape, to create a fly's eye view effect. Breaks the image into hexagon shaped tiles and transforms the image within each shape, to create a fly's eye view effect. Generates a version of the source clip using two sets of black and white lines of varying thickness to give an 'etching' or 'lithograph' look. Embosses the source clip using the Bumps input as a relief map. Embosses and warps the source image using the bumps input as a relief map and lens image. Embosses and warps the source clip using the bumps input as a relief map and also distorts the result using the bumps as a 'lens' image. Assigns different colors to the edges of the source clip depending on their direction. Generates a dual color-channel version of the input image, as might be perceived by the limited color vision system of dogs. Auto-generates a version of the source clip with a cartoon paint-brushed look. Generates a version of the source clip with a cartoon look. Generates an X-ray-like effect using a band-pass filter. Inverts the colors of the input clip that are brighter than the threshold value, to create a 'solarization' effect. Generates a version of the input with a hand drawn sketched look. Simulates a pen-sketch crosshatched look using overlapping strokes. Transitions between two input clips using a bright glowing flash. Transitions between two input clips while blurring each. Transitions between two input clips by giving the appearance of a quick pan. Transitions between two clips by rolling one off screen vertically and rolling the other on. Transitions between two clips by applying a shaking motion along with a quick dissolve. Transitions between two input clips using an animated lens flare. Transitions between two input clips by simulating a channel change on an old television set. Performs a wipe transition between two input clips using a wedge shape. Performs a wipe transition between two input clips using a pattern of growing or shrinking hexagons, triangles, diamonds, or stars. Performs a wipe transition between two input clips using a star shape. Performs a wipe transition between two input clips using a series of stripes. Performs a wipe transition between two input clips using a pattern of concentric rings. Performs a wipe transition between two input clips using a growing or shrinking rectangle. Transitions between two input clips by adding brush-like polygon shapes from one clip onto another in a semi-random order. Performs a wipe transition between two input clips using a plasma texture with moving tendrils. Transitions between two input clips by adding blocks of pixels of one clip onto another in a semi-random order. Performs a wipe transition between two input clips using a pattern of combined concentric rings. Performs a simple line wipe transition between two input clips. Transitions between two clips by rapidly cutting back and forth between them, optionally inserting solid colored or inverted frames as well. Transitions between two clips by sliding or spinning the outgoing clip to reveal the incoming clip behind it. Performs a wipe transition between two input clips using a pattern of four wedges merging into an 'X' shape. Performs a wipe transition between two input clips using a flux texture with mostly round cells. Performs a wipe transition between two input clips using two wedge shapes. Performs a wipe transition between two input clips using a grid of growing or shrinking dots. Wipes between two input clips with a pixel-diffusion process performed within the transition area. Transitions from the first clip to the second using a moving cloud texture. Performs a clock wipe transition between two input clips. Performs a wipe transition between two input clips using a grid of growing or shrinking checkers. Performs a wipe transition between two input clips using a pattern of procedurally generated cellular shapes. Wipes between two input clips with a bubble-warp process performed within the transition area. Performs a wipe transition between two input clips using a pattern of blobs generated by a noise function. Performs a wipe transition between two input clips using a texture resembling perpendicular woven strands. Dissolves between two input clips while performing 3D moves on each. Transitions between two clips using animated lightning bolts. Transitions between two input clips using a waves warping function. Transitions between two input clips using a vortex warping function. Transitions between two input clips using a speckled noise pattern. Transitions between two input clips while breaking each up into tiles and scrambling them. Transitions between two input clips using random pixel static. Transitions between two input clips using animated rays. Transitions between two input clips while warping by a circular pattern of waves. Transitions between two input clips using a pattern derived from their luminance. Transitions between two input clips using a bright glowing glint. Transitions between two input clips using animated glares. Simulates lots of flashbulbs going off while dissolving between two clips. Transitions between two input clips using a film dissolve with selectable gamma. Transitions between two input clips using animated edge rays. Transitions between two input clips while distorting each using the gradient of the other. Transitions between two input clips by scrambling the pixels of the inputs within an area determined by max amount. Transitions between two input clips while defocusing each. Transitions between two input clips using a bubble warping function. Performs a wipe transition between two input clips using a growing or shrinking circle. Mocha Pro is a planar tracking and roto application featuring advanced modules for Object Removal, 3D Camera, Stabilization, and Lens Correction. The Boris FX Mocha Pro 2019 Plug-In for Adobe gives you the flexibility to use Mocha right from within Adobe After Effects and Premiere Pro. This is an upgrade from Mocha Pro 5 Plug-in to the Mocha Pro 2019 Plug-in for Adobe and renews support for one year. The Mocha Pro 2019 Plug-in for Adobe can be used in a stereoscopic workflow in the host application but doesn't offer any independent stereoscopic tools. Also, the plug-in uses the host application's media engine and project format, thereby reducing the need for transcoding or external file management. The award-winning Mocha planar tracker is updated with GPU accelerated object removal, 360/VR workflows, four new spline tools, and a redesigned workspace in Mocha Pro 2019. Mocha Pro has been used on thousands of feature films and television shows, including Star Wars: The Force Awakens, Mad Max: Fury Road, and Game of Thrones. Mocha's powerful masking tools are improved with four new spline tools to speed up shape creation and save time on roto projects: Magnetic Spline Tool with edge snapping, Freehand Spline for fluid drawing, and New Ellipse and Rectangle Shapes. The updated interface makes Mocha easier to learn than ever before and looks great on hi-res and retina enabled monitors. The Mocha Essentials Workspace brings the power of Mocha to novice-level users with a simplified, elegant, and easy-to-learn interface. Tracking and masking is now faster by reducing complexity and focusing the Mocha interface on the most essential icons and tools. Switch to Classic for advanced modules and customize workspaces for flexibility. Mochas Remove Module has been rewritten to optimize GPU video hardware for up to 4-5x render speed improvements on removals and clean plating projects. For high-resolution 4K projects and 360/VR video resolutions, the resulting speed improvement is a massive time-saver. Mocha Pro 2019 now includes all of Mocha VR's features for mono/stereoscopic 360 effects and finishing such as stereo 360 planar tracking and masking, a unique spherical 360 workspace, horizon stabilization and reorient, new and improved GPU-accelerated object removal as well as stereoscopic masking tools such as anaglyph view, L/H hero mode, and lens workflow for equirectangular to flattened conversions. X-spline and Bezier tools are designed to quickly create and edit detailed roto shapes, and Mocha Pro 2019 now has new Magnetic and Freehand Spline tools. When linked to Mocha's planar tracking, roto shapes inherit motion and perspective, dramatically reducing manual keyframe work. Advanced tools for shape editing include per-point edge feathering, join layers tool, transform tool, group layers, and more. The Remove Module is an advanced alternative to traditional clone and paint techniques for getting rid of unwanted pixels and removing objects, and it's now even faster with GPU rendering. It automatically detects and blends pixels from other frames with little user input, offering massive time savings. Mocha Pro's clean plate functionality imports and corrects fixed frames for digital beauty work and matte painting. The Insert Module allows you to render an image onto your tracked surface within Mocha Pro or back to your host timeline with the available plug-in options. Composite with realistic motion blur or render out the tracked insert. A powerful mesh warp distortion tool allows the user to wrap and bend inserts onto non-flat surfaces. The Insert Module combines with the Lens Module for realistic VFX compositing on distorted footage. The stabilize module can lock down camera motion or stabilize moving objects for visual effects and finishing work. A smooth option with selectable anchor frames helps reduce high-frequency jitters while maintaining original camera motion. Center, scale, or crop stabilized footage based on user driven planar tracking.